If you are working on Unix-based systems sometimes, you may have come to like the menu bar that many systems display at the top of the screen. You cannot really get the same on Windows, even though it is possible to move the taskbar to the top of the monitor screen. Nucleus is an attempt to bring a Unix-style menu bar to the Windows operating system. The product is provided as an alpha version right now which is feature limited. It is however interesting enough to take a closer look regardless of that, to find out what it has to offer right now, and for comparison once the final version gets released in the future. Note: This alpha version is not intended for productive environments. While I did not notice any issues while running it on a 64-bit version of Windows, your experience may differ so keep that in mind. There is not a lot that you can do right now, but some functionality is already here. Two main features that Nucleaus supports right now are notifications and the terminal. Notifications are currently limited to Gmail. 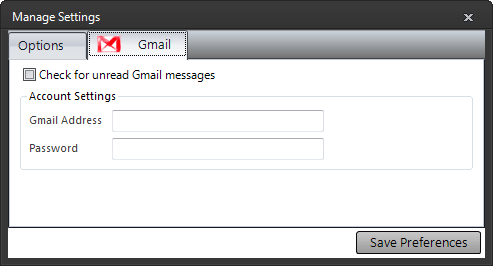 You can open the program settings to enter Gmail account information here. You will receive information about unread emails on the screen from that moment on and for as long as Nucleus is running on the computer. The Terminal on the other hand provides you with several commands that you can run using it. This includes options to run any app, kill any process, search on the Internet using Google or get information from Windows (currently only uptime and Windows key). You do get a bunch of system wide shortcuts on top of that. Use Windows-Shift to open the Nucleus Terminal, or Shift-Ctrl-M, V or P to open the Music, Videos or Pictures libraries in Windows Explorer. The program is no replacement for the start menu. 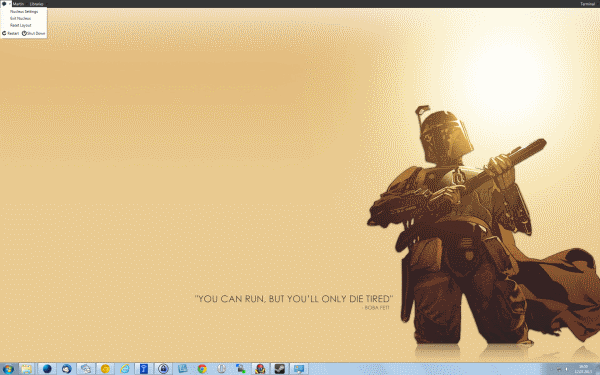 If you are running Windows 8 however, you may want to give this a try once it comes out of alpha. The alpha version has a couple of quirks, like not showing a window's titlebar if maximized so that you cannot really move it or close it. Some terminal commands did not work as well when I tried them (search) while others worked just fine (uptime). No verdict yet as it is an alpha version. It definitely needs some work, additional features and a list of all running windows and programs for example. Hi Martin, I’m the developer of Nucleus. I just wanted to stop by and thank you for the write up. I appreciate making note of just how early into development the project is, there will definitely be lots of significant improvements before a ‘1.0’ is released. Shane, thanks for stopping by. I’m looking forward to version 1.0. You say “there will definitely be lots of significant improvements before a ‘1.0’ is released” but the alpha version available on your Web site dates back from February. Has there been any progress since then? When is the next version expected? Nucleus is very much as ‘side project,’ so updates will be less frequent than our other titles. Work has been ongoing though; with new builds implementing a “Spotlight” feature (Mac’s equivalent of the start menu search) and further improvements to the notifications API. *Nucleas* in the title should be Nucleus I suppose. Eh.. I don’t have any menubars in my unix environment (because 100% of my use is with shell and there I don’t need any menus). SingularLabs makes awesome software, and this is no difference. This program has a lot of potential. Kind of disappointed it only allows Gmail (instead of just IMAP) and no sleep option, but I could see this being a powerful add-on for Windows in the near future. Interesting software. It is almost useful. There is the (prohibitive) system requirement of the Microsoft .NET Framework (according to the software download page “any [.NET Framework] version”).